Zamia sp. 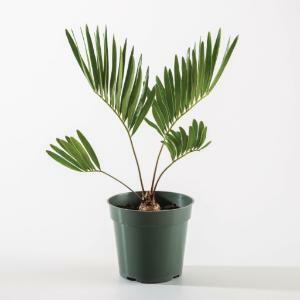 Native to tropical and subtropical regions of the Americas, Australia, and Africa, but adaptable to a classroom environment, Zamia features palm-like leaves, straight venation, and determinate cones (the female cones with two ovules). It’s a member of the Cycads, which are very primitive gymnosperms, and so exhibits primitive characteristics. It is supplied in a pot with care instructions. Size: 3".